Antoine Fuqua’s remake of the classic 1960’s western opens with a public meeting in the crowded church of a small frontier town. If you’re familiar with the original, itself a retread of Akira Kurosawa’s Seven Samurai, you know the story: a simple, helpless community is being terrorised by an army of bandits, here led by industrialist Bartholomew Bogue (Peter Sarsgaard). Looking to clear the townspeople from their valuable, mineable land, Bogue and company interrupt the meeting. After some cartoonishly villainous posturing from Sarsgaard, several of the townspeople are shot dead and the church is set aflame. This jarringly mean-spirited opening sets the tone for the rest of The Magnificent Seven; what should be a convivial romp of an ensemble-adventure is notably without an air of fun. The few jokes we get, mostly delivered by a loveable-as-always Chris Pratt, are notably out of place in a script that more often that not takes itself very, very seriously. Similarly, The Magnificent Seven is plagued by a tonal inconsistency that awkwardly shifts from moments of grim stoicism to light-hearted camaraderie. While it’s somewhat enlivened by a solid, likeable cast and some thrillingly choreographed shoot-outs, Fuqua’s western is an emotionless, machismo-heavy affair that, bar a few tenuous throwback quotes, makes little attempt to conjure up the spirit of the original. 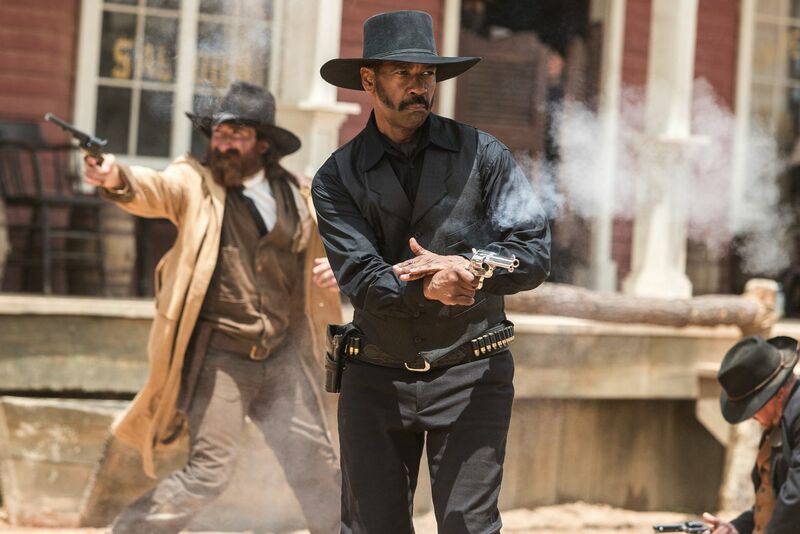 Denzel Washington, dressed head to toe in black as this iteration’s Yul Brynner, plays bounty hunter Sam Chisolm. Hired by the townspeople to protect them from Bogue, Chisolm enlists the help of a wise-cracking gambler with a debt to pay, Josh Farraday (the aforementioned Pratt), and five other mismatched, multi-ethnic outsiders. Arriving at the town, the Magnificent Seven set to training the townspeople for the approaching encounter with Bogue and his men. Most of these new seven borrow some characteristic or other from the heroes of the original film. Unfortunately, any real attempt at characterisation stops there. Manuel Garcia-Rulfo’s Vasquez is a Mexican, Martin Sensmeiere’s Red Harvest is a Comanche and Byung-Hun Lee’s Billy is a Korean assassin – one particularly good with knives. These characters are barely defined beyond the ethnicity, yet the film makes no attempt to probe further into issues of race, bar a few offhand comments directed at Chisolm toward the start of the film. While the script, penned by True Detective creator Nic Pizzolatto, attempts to inflect each character with a reason to fight, any real character motivation is established far too late into proceedings to get us emotionally invested. Of the seven, Ethan Hawke’s PTSD afflicted sharpshooter Goodnight Robicheaux is given the most depth. Evoking Robert Vaughn’s war-weary veteran from the original, Goodnight can’t bring himself to fight, traumatised from the body count he inflicted during the Civil War. Through Goodnight, the film tries to say something about the dehumanizing nature of violence, yet it ends in a savage bloodbath that takes up the majority of the lengthy third act; such is the confused message and tonal inconsistency of Fuqua’s film. Admittedly, the climactic shoot out is exciting stuff, but were the team building segment given as much screen time we might have more reason to care about the seven’s final stand. That’s really the bottom line here – Fuqua gives us little reason to empathise with his Magnificent Seven. Furthermore, that integral character in any western, the landscape of the vast American west, isn’t given enough prominence for the film to feel authentic. In the end, The Magnificent Seven isn’t much more than a gritty action movie with a half-baked message. There are certainly some thrills to be had here, but without any real emotional depth, The Magnificent Seven is sadly forgettable.